2016 saw the so-called Islamic State (IS) in retreat following sustained bombardment and military attacks and airstrikes by the US-led coalition as well as Russian and Syrian forces. It has conceded large swathes of territory, towns and cities, and lost some of its top commanders and strategists and more than 25,000 fighters. The group‘s revenue has declined and so has the flow of new fighters. It has to contend with desertions, in-fighting and scarce resources. Its fall-back wilayats (provinces) in Libya have been lost and many in the liberated areas of Iraq and Syria are jubilant at its ouster after holding sway for more than 20 months. Its declaration of the caliphate is rejected by the Muslim world, which has denounced its acts of violence and misreading of religious texts. Since its formation, IS remains the object of condemnation and denunciation by the whole world. Even so, the terrorist threat posed by IS and its decentralised networks in 2016 shows no sign of abatement. Throughout the year, IS‘ active worldwide networks demonstrated the ability to plan, direct, train, recruit and radicalise from abroad, operating with impunity and surpassing the threat from Al Qaeda‘s old guard. The year saw a number of IS-directed or IS-inspired attacks by terror cells or ‘lone wolves‘ in major cities like Brussels, Nice, Orlando, Istanbul, Dhaka, Jakarta and Berlin resulting in thousands of casualties. Its propaganda machinery and online presence remain formidable, exploiting technology for communications, recruitment, finance, training and terrorist operations. IS has caused the displacement of millions and triggered a humanitarian crisis among refugees and in the battle zones. The group‘s extremism and violence have contributed to inter-religious tensions and discord, and strengthened anti-Islamist movements in the West. The stage is therefore set for 2017 to be a portentous and decisive year for IS and countries afflicted by the threat of terrorism. As IS loses control of Mosul and Raqqa in coming months, it will change strategy, focus and priorities. 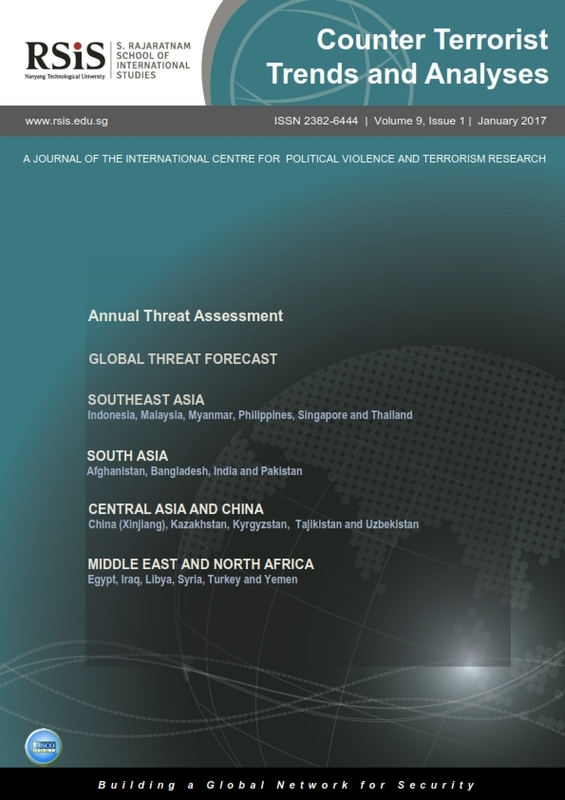 How it will change and what the impact will be are issues addressed by Rohan Gunaratna in his article on Global Threat Forecast, as well as in accompanying articles on the terrorism situation in selected countries and regions. As IS continues to lose ground in Iraq and Syria, it will transform itself from a caliphate-building entity to a terrorist organisation. It will seek refuge in its many wilayats and enclaves, and consolidate, expand and use them as launching pads to mount terrorist attacks. The group will continue with its strategy of expanding the ‘battlefield‘ to the West and elsewhere, and hit ‘soft‘ and easy targets. Overall, the terrorist threat will endure in the New Year and will continue to require effective counter-insurgency, counter-terrorism and counter-violent extremism measures.